It’s now Day 10 – but Day 9 was so stuffed with activities that I couldn’t possibly take the time to write any of it down. But now, with a seat by the pool and the sound of rippling water, I can tell the story of yesterday. It began at 3:30 a.m. Bleary-eyed and a little heat-exhausted already, I stumbled around our hotel room and prepared my knapsack for the day. 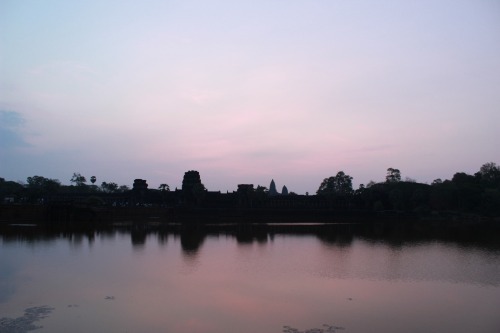 We were all going to see Angkor Wat at sunrise – or most of us, anyway. Charlee was staying behind, still recovering from a stomach bug; Lauren, both Rileys and Maddy were toughing it out and coming with us regardless. We even had to leave behind 5 girls in Phnom Penh with a wretched stomach sickness, though I hear they might be trying to join us in Siem Reap late this evening. My stomach has been holding up alright – a little queasy with eating foods cooked not like I’m used to, but hanging in there. 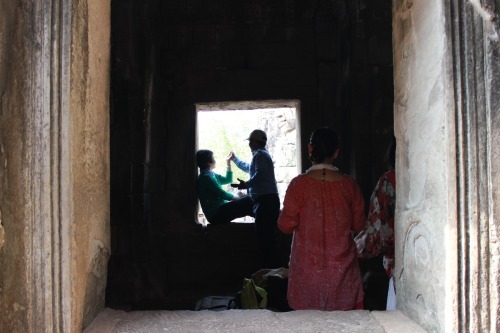 Loading up the buses and stopping first at the Angkor Wat visitor’s station – found the foreigners! – we continued to drive along the bumpy roads of Siem Reap. The darkness betrayed my singeing excitement, burning like a wildfire in my veins. We crossed another checkpoint. Finally, the van parked along the bank of a moat; Angkor Wat’s highest towers still shrouded in the emerging light of dawn. We sat along the moat. Perfectly placed in line with Angkor Wat’s quintessential sky-rises – a human-constructed temple built 9 centuries past – our tour guide assured us we would see the sun surface here. I doubted him at first – it was pitch black after all – but in the end gave him kudos for his keen eye. As the sun continued to stretch its arms across the far side – painting the sky light shades of periwinkle and lilac with a patience I found admirable – a throng of people were already making their way inside the temple walls. In the dim light, all I could make out were the tiny heads, arms, and legs of people – shadows in the reflecting water – not their iPads, fanny packs, or fancy cameras. I tried to imagine these hovering dots as the people of Angkor, the ancient civilization of modern-day Cambodia. In the darkness, with Angkor Wat majestically rooted in the background, it could have been 1100, 1509, or 1996. Interesting how time becomes irrelevant with the same ingredients: a temple, a few faithful, an everlasting wonder with the world. Nibbling on crusts of bread and capturing every discernible color change in the sky, I waited. Suddenly, the sun hoisted himself from the horizon line and showed himself to the southeast Asian world. It was breathtaking; the orange orb – a perfect circle – poked its head out in between a tree and the farthest left tower. Our tour guide was just as miraculous with selecting our spot as this sunrise continued to illuminate the world of Angkor in orange. It moved quickly, climbing up above the three main towers like a pinball ricocheting from its dispenser – or a bullet ejected from a gun. Our tour guide described how the grounds of Angkor Wat have hosted numerous battles between the Cambodian people and their various enemies of time and place; you can still see some of the bullet holes punctured in the slabs of slate as you stumble into the complex. After a few minutes – or was it a few hours? – we all shook the tendrils of sleep and meandered across the bridge into Angkor Wat temple. 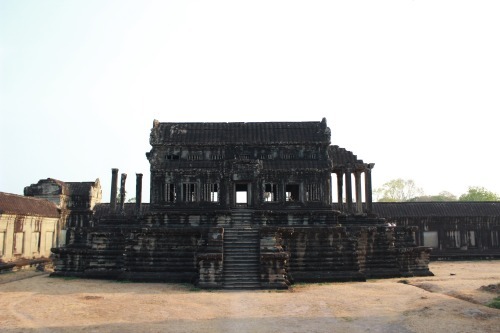 The entire complex of temples – including Angkor Wat, the most famous – spans over a couple hundred football fields, I believe. I was skeptical of the comparison at first – until I realized we would need a bus to transport us from temple to temple. Those moments were tiny oases in the frying pan of heat we encountered throughout the morning. 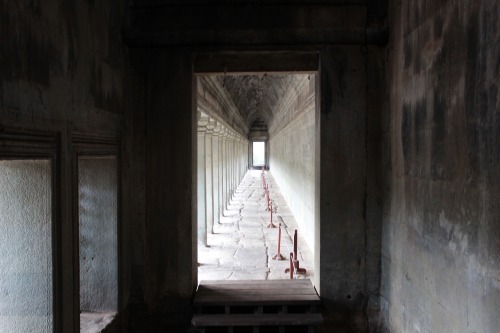 Inside Angkor Wat, I lingered along the inside halls and departed from the guided tour. Some things are better left to experience alone. Mystified at the intricate carvings and spellbound by its existence, I climbed (yes, actually hands-and-knees climbed) up the steps to a side tower and drank in the view (and some more water). Relatively isolated, I listened: The only sounds I could hear were the quiet babble of voices in another language. That was it. No cars, no telephones ringing, no vacuum cleaners, no water bottles crinkling. I closed my eyes. In this moment, sitting on the steps of Angkor Wat, breathing in the heat and humidity, letting the sounds of another language envelop me, I imagined I was in Angkor of old. I opened my eyes. I saw vivid colors and waves of heat, parched and matted yellow grass. I was still in the present – or was I? These are the same exact colors, shades, and hues that the Cambodian people of the 12th century saw, I thought. Forget the black and white photos, the sepia-toned images that mark “ancient” in our modern-day context of pixelated color. These people were alive and real and saw everything with eyes as attuned to color, shape, and scale as mine are – right here, right now. I let the thought sink in. 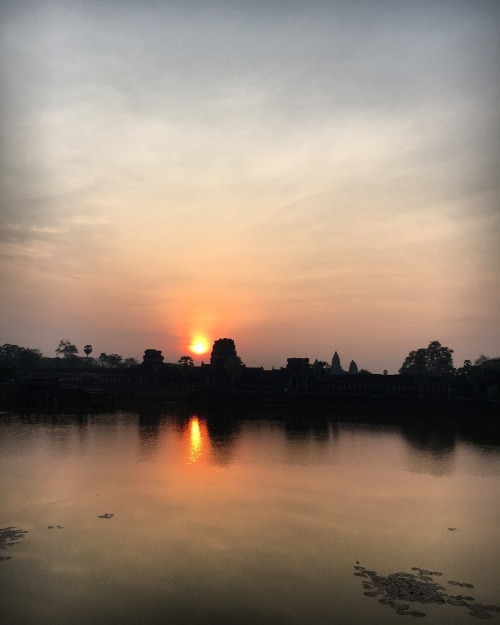 The passage of time – the concept, the mystery, our obsession with it – came back to me, just as it appeared to me on the shores of Angkor Wat this morning. In this moment, who could say it is the year “2016”? It is not written in the sky, only on paper that we humans have harvested from trees and made our own. Who could say we are more “civilized” than those who came before? I’m sure “they” thought of themselves as so, and no doubt our lineage will think the same as us now. Now. This is all we can grasp lucidly. Now. It echoes and begs us to wonder about before and after. Now. But isn’t it all truly the same – equal in quantity and quality? Now. I walked down a stone-encased corridor, with pillars on my left and an intricate design carved in the wall on my right. I closed my eyes again. I continued walking gingerly. Step, step, step. The echo of feet on stone, the only sound detectable to my ears, enraptured me. To think that for hundreds of years this sound in this corridor has remained the only constant, and here I was, playing along with a tune that will never fade, so long as these stones shelter people from the mess and destruction of the outside world. A powerful thought. I walked on. The voices and the breath of the Angkor people pushed me on with silent song, encapsulated in the stories and walls and memories of Angkor Wat. A tiny tear escaped my right eye. A wave of emotion and calmness blanketed my skin – just like the pool water from our hotel the night before – that I scarcely breathed aloud. A fragile moment of clarity and centeredness. I excited the corridor to embrace the outside world, once more. The rest of the morning we spent wandering the temple grounds of two additional complexes – the Bayon Temple and the Ta Prohm, the temple grounds filmed in the movie “Tomb Raider.” I greedily captured as many of the wall carvings and headless Buddha statues as my camera card could hold. It was all so overwhelming – the heat, the history, the hidden magic – I didn’t register it all right away. But I’m sure I’ll be thinking about the temples for as long as I am living in this present life. Walking into the farthest temple, we stood shoulder-to-shoulder with a cluster of orange-robed, young monks. Walking back to the buses six or so hours after sunrise, we were bombarded by a swarm of villagers, thrusting their wares into our wake. I looked down and panted, too consumed by my own dripping sweat; I was tired and ashamed. We had all been warned about the villagers, desperate for tourism and financial support from Westerners. But we had also been warned of reaching for our wallets, creating false hope, and perpetuating this cycle of capitalistic madness – where was the money going? Who would it feed? What would it buy? I panicked and kept my head down. But a little girl, waist-high and probably 6 or 7 years old, followed me. “2 for one dollar,” she said, holding up two magnets with Angkor Wat emblazoned on them. I shook my head and silently trudged on. “3 for two dollar.” She held up another one in her fragile hands – hands and skin and eyes that reminded me eerily of my cousin Caroline. “4 for two dollar.” She was desperate now, a pleading in her tiny voice. “5 for two dollar.” The magnets barely fit into one hand now. I couldn’t say anything. I could only move my feet. One step. Two step. Forward. Forward. She followed our group to the buses. Her face hovering just above the glass window. I looked out at her. I was paralyzed by fear, by pity, by regret, by fatigue. We were separated by more than just a wall of glass. I couldn’t touch her, I couldn’t reach her – or she couldn’t reach me. She didn’t get any money from me. But she stole a piece of my heart locked away in an ivory tower. She found a way in, but I don’t know how. I think it was her eyes; she looked like she could be Caroline. The rest of the afternoon I slept, woke, and swam in a fit of heat. I was definitely experiencing an advanced degree of heat exhaustion – despite guzzling 1.5Ls again – or maybe it was my karma calling out at me. I don’t know. All I remember was being in a state of hunger, coffee-deprived, sleep-deprived, and too hot to cool off. A couple meals later, and a few short naps in between, and I was back to okay. The tuk tuks pulled up; I almost opted for an early night in, but I’m so thankful I muscled through for the circus. First off, the Cambodian “circus” is not a circus – it’s a theatrical performance that just happens to include acrobatics. It’s a story – a story told through song, acting, dancing, painting, and expression. And it’s all performed by young adults. But not Cambodia’s “finest,” at least by economic standards. These young people were taken from the poverty line, Cambodia’s streets, and made whole again through the practice of traditional art forms. And with a free meal a day, training, community, and education, these young people really are the lotus flowers of Cambodia’s 21st century. The performance we witnessed last night, all huddled underneath a circular, circus-esque tent, told the story of one of the circus founders. From child solider during the Khmer Rouge to the aftermath and the rebuilding of a nation with so much loss, the performance was stunning – and entertaining! My mouth was hanging open in awe for most of the performance. This is why I became a dancer. This is why I chose to stick with show choir: The power of performance. There is nothing short of exhilaration when you perform and are able to give an audience an emotion you yourself feel with your whole body. It’s like communicating an unspoken language of empathy, rage, beauty, and mystery – all in the contortions and sounds of the body. The gift of performance – not strength, not power, not intelligence – is arguably the most sacred of all human abilities. Though the entire show – masterpiece, really – was jaw-dropping-ly spectacular, I do have a favorite moment. One of the performers appeared on stage only to paint on canvases in the background, as the acrobats danced around the front of the intimate stage. During the beginning scenes, he gracefully painted a portrait of a Buddha – free-form, practically finger-painting, but astonishing in its detail and shading. But about a quarter of the way through the 90-min. show, he appeared again. This time, he smeared the Buddha with grey paint, symbolizing the erasing of religion during the Khmer Rouge take-over in the late 1970s. But what he painted next I’ll never forget. With a sponge dipped in black, he stamped the canvas, with what I thought at first were fish. Instead it was bombs. Bombs falling from the sky – but not just any bombs: American bombs. It is said that the United States dropped more bombs in Cambodia between 1965 and 1973 than all of the Allied bombs dropped in World War II. I dare not imagine the magnitude of such a mere statement of fact. The painter then dipped his hands in a bucket of red paint. As the music climaxed in a crescendo, and the pianist slammed the keys two rows below me, the painter began throwing flecks of red paint at the bombs, each fist-full of more intensity. 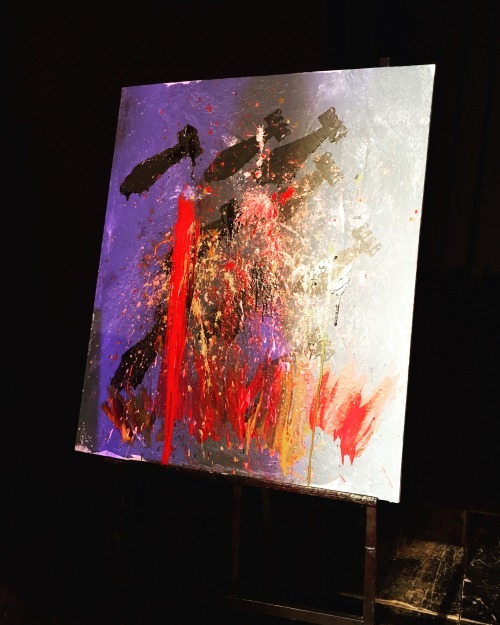 All at once he began chucking the paint so ferociously on the canvas it splattered the ground. Like the blood of hundreds of thousands of Cambodians, screaming from destruction. American-born destruction. The painter stopped. The music swelled. The tears in my eyes fought desperately to stay. They did then, they don’t now. Because for as much as I like to cling to my immigrant roots and shun the sometimes shameful American culture I encounter, I am an American. It surfaced when I spoke with my tuk tuk driver at dinner during the night market adventure. It exploded on me when I watched this painting unfold. But to approach this Cambodian after the performance – a young man of my age – and to look him in the eyes, a single breath between us, both of us knowing the truth of our tangled, unspoken past as enemy countries, was the most powerful experience of all. I keep thinking of the paint splattering, and the fierceness at which he threw the paint – with a rage so visceral it stung – as I now look up at the sky and hold back gasps of tears. Up at the sky. A sky that I could barely gaze at on our bus ride to Siem Reap. Because it looked just like the clouds outside my bedroom window at home, in the comforts of suburbia. The sky shouldn’t look the same when poverty begets a wasteland of waste, dust, and broken houses. The sky shouldn’t look the same when the only difference are the bombs piercing the stratosphere. The sky shouldn’t look the same on the other side of the world, a place often forgotten and “still developing.” But it does. Dear God, it does. Then how did we let it happen? How did we let bombs and missiles and destruction rain down like water, from a sky that looks just like “ours”? On to a people with eyes and hair and glistening sweat on their backs when they work, like us? Just like us. The sky betrays me. It betrays us all.